We would like to wish on behalf of the class the best of luck to our optimist sailors who are going tomorrow to Monaco to represent this club at their prestigious team racing event. The sailors include Harry Twomey, Rory O Sullivan, Cathal O Regan, Killian O Regan, Team Parent is Dave O Regan and team coach is John Durcan. This is a four day event starting this Thursday and they will be up against top class international opposition. The Royal Cork is honoured yet again to be asked to participate and on behalf of all I would like to thank everyone for making this happen. 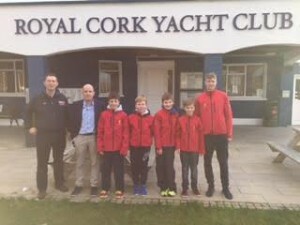 The Royal Cork is twinned with Yacht Club De Monaco and this year Gavin Deane visited the club represented RCYC for this twinning ceremony.